If a setting value of multiple elements (e.g. a couple of fields in an entity or several entities) has to be changed, you can do that through the element editor however if you have to set a lot of settings in various elements, it's might be a bit tedious. To help change setting values in bulk for multiple elements, a different dialog is available, the Bulk Element Setting Manipulator. To open the dialog, select Project -> Bulk Element Setting Manipulator from the Main menu or click the button on the toolbar. This dialog allows you to select all elements of a given type (similar to the project settings selector for defining the default) which are displayed using the same logic as in the element search results. 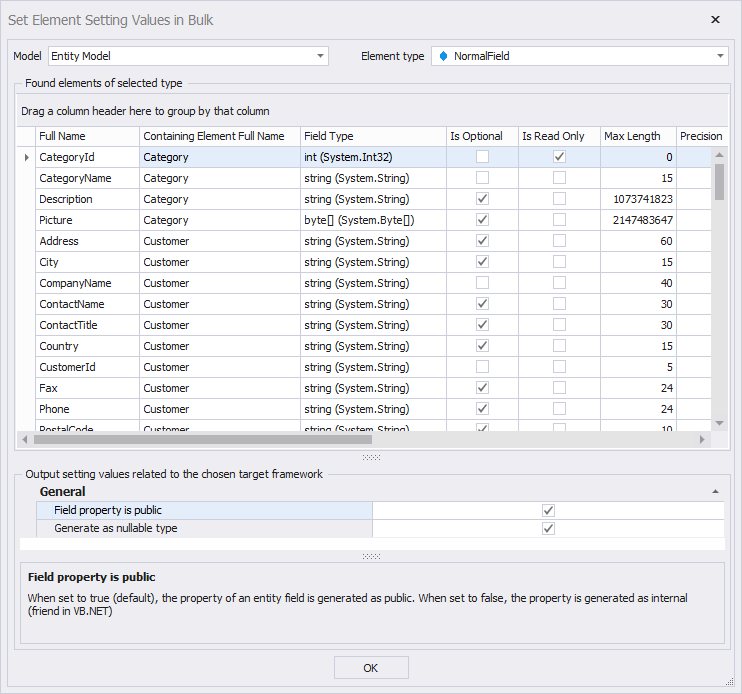 You can then select multiple elements in this grid and the settings of all selected elements are displayed immediately, below the grid in a property grid, so the user can manipulate the settings of all selected elements. As settings have no undo feature, this dialog doesn't have an undo feature as well.